My grandfather's and grandmother's Rolex wristwatches. My grandfather's watch is on one of my Type B straps. If you click on the picture you should get an enlarged view. Many wristwatches from the early twentieth century have the 12 on the dial picked out in red like my grandfather's wristwatch pictured here, and sometimes (more rarely) blue. Why is this? 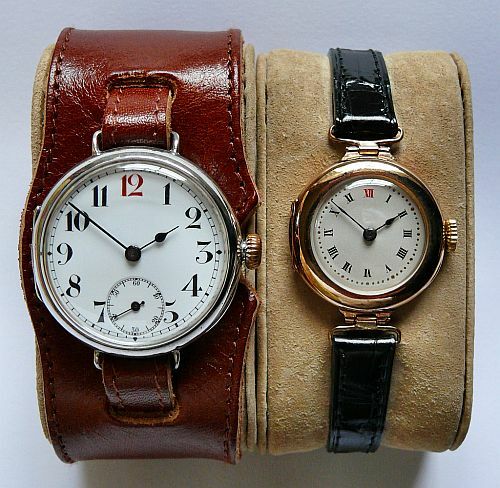 Many sellers puff up a red or blue 12 as if it means that it is a "military" watch, or is really very significant for some unspecified reason. Some people even seem to think a red 12 identifies a watch as a Rolex - and are generally disappointed; early Rolex wristwatches certainly did often have red 12s, but then again so did many other makes of wristwatch, and for the same reason. Note also that both my grandfather's and my grandmother's wristwatches have red 12s. The red 12 wasn't a sign of a man's watch, it was used just as much on ladies wristwatches in the early days of the wristwatch. I have never come across any documentary evidence about the "red 12", but as an engineer concerned about ergonomics I think it is pretty clear that picking out the 12 in a contrasting colour does have more significance than just a style or fashion. It was certainly in use on ladies wristwatches well before the Great War, when wristwatches started to be used by men for the first time in great number, so it is definitely not a sign of a man's watch or a military watch. During the Great War (1914 - 1918) it was quickly realised that a vital feature of a military watch was a luminous dial so that the time could be read in the dark. Many watches with red 12s do not have luminous dials, which is another indication that the red 12 was not a military feature. You can read about military watches used Great War on my page trench watches. When the wristwatch was a new idea, the position of the 12 wasn't immediately standardised at its now familiar position 90° anti-clockwise from the winding crown, (which is convenient to wear on the left wrist). Sometimes it was adjacent to the winding crown as on pocket watches or in an intermediate position between the crown and 90° anti-clockwise from it. Many early wristwatches were simply pocket watches either held on the wrist in leather cup attached to a strap, or with a chain or strap attached directly to the case by wire lugs. Because of this they didn't all follow the now accepted design of a wristwatch with regards to orientation of the dial and location of the crown. I have seen transitional wristwatches which, when strapped to the wrist, would have the 12 where we would expect to find the 3 today. Two Pocket Watches - Find the 12s! The contrasting colour of red or blue for the figure 12 was used establish the correct orientation of the watch by drawing the eye to the location of 12 o'clock. Familiarity with the watch dial means that we don't often pause to think about how complex its display is. There are very few instruments which use two, or even three in the case of a centre seconds dial, coaxially pivoted hands, and none that are in such wide use. From an ergonomic perspective, this could be a nightmare; and yet, with the hands carefully designed so that it is apparent which is the hour hand and which is the minute hand, we can read the time to the exact hour and minute from a watch dial at a glance. And we can do this even if the numerals are replaced by markers, and even, in the extreme example of the Movado "Museum" watch, if the markers themselves are completely absent - absent, that is, apart from a single dot at 12 o'clock. It all hinges on the position of 12 o'clock. Which is why when the wristwatch was new, the 12 was often picked out in a different colour: it's all due to ergonomics. The advert from 1916 by Smith & Son Ltd. reproduced here is quite interesting. It shows two trench watches, called the "Smith's 'allies' watch wristlet", both of which have Borgel "screw in" dust and damp proof cases, luminous hands and numerals and unbreakable crystals, or "unbreakable front" as the advert puts it. The watch on the right has a sweep centre seconds hand and is called a "Medical Watch", said to be invaluable for hospital work. The additional red cross above the 6 on the dial emphasises this intended use, although of course there is no guarantee that such a watch was actually used in a military hospital. The centre seconds adds considerably to the cost of the watch at four pounds and fifteen shillings. Both of these watches would have had red 12s. The thing that marks out the watch on the right as a medical watch is the sweep centre seconds hand, which would have been very useful when taking a pulse. It is much easier to read than the small sub-seconds dial of the watch on the left. The small sub-seconds dial was useful in the field as a quick check to make sure that the watch was working, especially in a front line trench where you wouldn't have been able to hear the watch ticking due to the noise of the guns. Picking out the 12 in a contrasting colour helps to locate the 12 quickly and easily; it's an ergonomic thing. A red 12 doesn't automatically mean that the watch was a military watch, or a medical watch, and it certainly doesn't uniquely identify a Rolex — although of course it could be any one, or all, of these; you just can't say from the colour of the 12; a red or blue 12 doesn't prove anything. A red or blue 12 shouldn't add to the value of a watch. It is very easy to paint the 12 red or blue, or any other colour, so anyone could do it — even on the cheapest of watches: there are no "barriers to entry", unlike making a fine quality precision movement. One thing you can look out for though is whether the contrasting colour of the 12 has been fired into the enamel of the dial, or merely painted on afterwards, which could even have been done recently, see Enamel Dials. In reality, it is the design, appearance, condition, and ultimately the quality of the case and the movement, that determines the value and historical significance of a watch, not the colour of some paint on the dial. However, if I were selling a watch and it had the 12 picked out in a contrasting colour, I would certainly mention it! I have reproduced below some of the contributions that I have received to date, which all back up the idea that the red 12 was a means of orientation. My speculation on the red 12: some makers did that because it wasn't get standard as to where the 12 was, at the now-usual position or by the crown, as on pocket watches. So, they made the 12 red so you could find it easier. I've seen ebay sellers assert that red 12 meant military, but there were too many watches, lady's, even, that had a red 12, so I've never thought so. The only thing I have heard that is most likely the true reason for the RED 12 (they also did blue 12s as well) was to allow the wearer to view the dial and have a QUICK reference point to where the 12 was. Keep in mind that when the wristwatch was first introduced for men in the WWI era many gentleman were used to looking at the crown to find midnight/noon as most pocket watches had the crown at the top of the watch, not at the 3 (except some hunters case watches). So for the first few years the colored 12 made it easy to identify where the top of the dial was. Re red 12's on supposed trench watches, I'm very dubious and haven't found any evidence to support the fact that the 12 earmarks them as military. We've just toured the Somme and all the other famous battlefields and cemeteries and only in Ypres museum did I see two genuine 'trench' watches. One had a loose criss-cross guard on it but no red 12 like a Buren I have with a large face. The other had a plain front without a guard and a red 12. 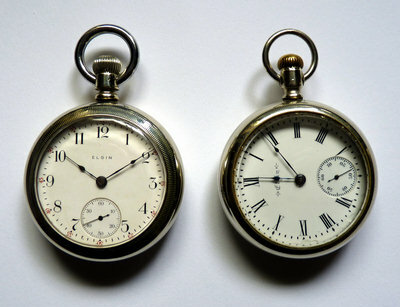 I have six 'trench' watches and even though all are dated between 1914 and 1918 I can never be sure of their past use. The wife tells me they are women's watches which doesn't help! One has a built in circular hours aperture guard and has a man's name engraved on the case back. The man's name is W.Aycliffe so I looked on Ancestry.com for the names of those issued with WW1 medals and found four William Aycliffes and I think three Walter Aycliffes. My watch is 1916 but all the men's records are not complete so I'll never know! A few years ago, I was given a wristwatch with lugs on it and a red 12. I took it to the chaps at the British Museum and asked them if they could tell me when it was made. According to their records it was made in 1918. I then asked them why the 12 was in red. They said that it was put on only to make the watch look special, as an incentive to buy it. They may have had a point. The watch is only a basic Waltham movement in a gold plated Dennison case but does look the business. I think their explanation holds true. Such subtle methods of fooling buyers are still used today. Copyright © David Boettcher 2006 - 2019 all rights reserved. This page updated February 2018. W3CMVS.